The primary clinical responsibility of the Qualified Medical Physicist is to assure the safe and effective delivery of radiation to achieve a diagnostic or therapeutic result as prescribed in patient care (Medical Physics Scope of Practice). The patient is the ultimate beneficiary of a medical physicist’s effort. Mechanisms to provide the necessary training and experience to become a qualified medical physicist are the focus of this report. The primary premise is that high-quality patient care is delivered by a team that has met a certain set of clearly defined and well-structured train- ing requirements, and that competency is determined by a peer examination. The training and experience requirements for most non–physician professionals involved in radiologic imaging or radiation therapy, including medical physicists, are being standardized at the national level in congressional bills (CARE [House H.R. 1426] and RadCARE [Senate S2322]). It is incumbent upon us to provide the mechanisms to be certain that medical physicists are properly trained. There is evidence that 200 to 400 qualified clinical medical physicists are required to join the workforce annually (various surveys). There are currently 21 CAMPEP-accredited residency programs (Commission on Accreditation of Medical Physics Educational Programs, Inc.), with a number in process. With available residency capacity it is currently impossible to produce the requisite number of properly trained individuals through these means only. The profession has resorted to a combination of mechanisms to meet these needs (see Figure 1). 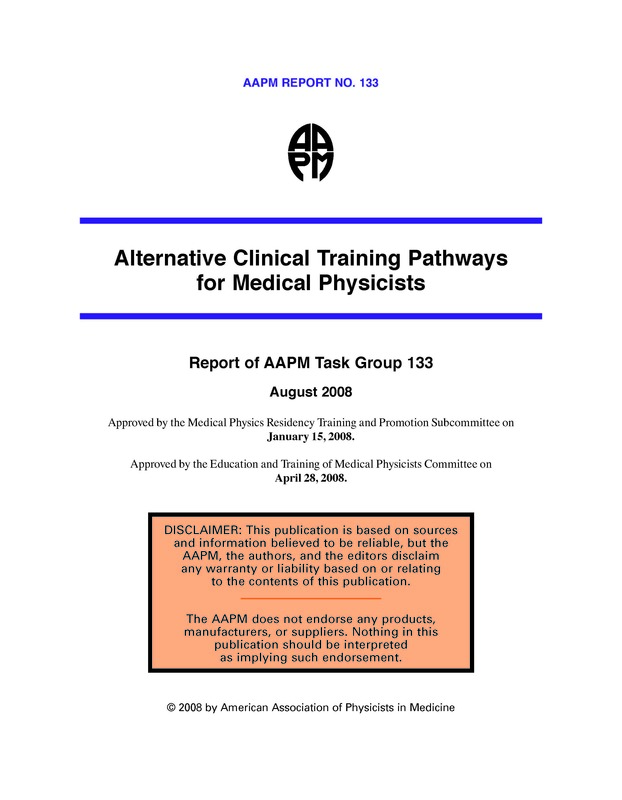 It is the charge of this task group to show how such a complex and inconsistent group of pathways can be replaced by an organized, structured pathway for the profession and meet the demand for competent med- ical physicists. The background leading to this Task Group 133 report is reviewed. This is followed by a description of the possible training models and the specific focus of TG133. CAMPEP require- ments for accreditation in a new program model are discussed, as well as a summary of signifi- cant issues for carrying this forward. Results of a Medical Physics Residency Training and Promotion Subcommittee survey related to training methods are then reviewed. Financial issues are briefly presented, and following the summary and recommendations are appendices giving specific examples of necessary essential documents, including a sample self-study document.